Note: This section of Dr.Bob's Delphi Clinic is devoted to news about Delphi XE2. These following Delphi XE2 Courseware manuals are distributed in PDF format and include free updates (for a period of a year) and e-mail support about the topics covered in the manual. If you want to order more than one title, please use the webshop at http://www.eBob42.com/Courseware. * All courseware manuals of 50 Euro or higher include a free bonus copy of Delphi XE Development Essentials. Customers outside of the European Union, or within the European Union but able to specify a company name and valid VAT number, do not have to pay VAT. Customers from the European Union without company name and VAT number must use the second link to pay with VAT included. Note that customers from The Netherlands must always pay 19% VAT, and should not use PayPal please but a regular bank transfer please (contact me by e-mail for details). On Monday, February 13th 2012, I've organised a Delphi XE2 and iOS Development seminar in Helmond Brandevoort, The Netherlands. All attendees presented have received the first edition of my Delphi XE2 iOS Development courseware manual (sold for 99 Euro for those who could not present). The first edition of my Delphi XE2 DataSnap Development manual is released. The PDF is sold for 99 Euro, which includes all updates until the end of 2012. The first 115-page edition of my Delphi XE2 Development Essentials in PDF format was released on October 14th, and is available from my webshop. I'm already working on the second edition as well as XE2 edition of my other courseware manuals. In this article, I'll demonstrate how we can recompile and install the ADS TDataSet component packages for Delphi and RAD Studio XE2 with a few minor changes and code edits. In this article, I'll introduce the new FireMonkey GUI framework and the cross-platform capabilities of C++Builder XE2, producing a cross-platform 32-bit Windows - Mac OS X application. Embarcadero has released Update 1 for C++Builder XE2, Delphi XE2 and RAD Studio XE2, incorporating more than 120 bug fixes, including many FireMonkey design time and runtime bug fixes, the addition of new VCL Styles, VCL Styles design time and runtime fixes, IDE fixes to improve stability, C++ and Delphi compiler fixes and more. Note that if you install from the web installer rather than the new DVD ISO, then you need to make sure to select an empty directory for the download files (otherwise, you'll get a dialog that asks you to overwrite the existing files - once for every 100+ file, not a good idea). After having applied Update #1, the About Box mentions the version number 16.0.4276.44006 (which used to be 16.0.4256.43595 in the RTM version, 20 days earlier). The XE2 editions of Delphi, C++Builder, Prism, RadPHP and RAD Studio have just been released. New User licenses as well as Upgrades to Delphi XE2 can be purchased now from me (for customers in Europe using the EURO, plus the UK). 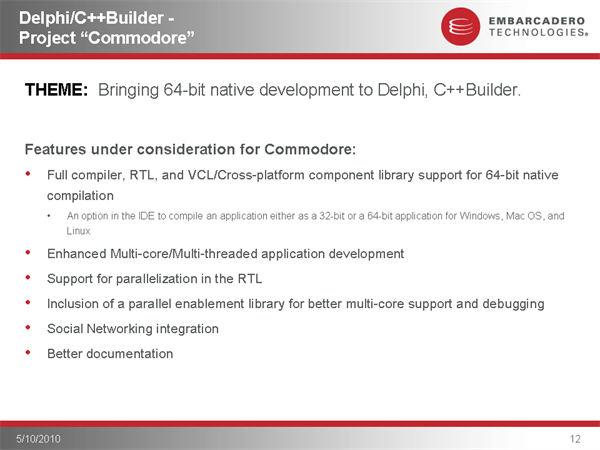 In this article, I'll cover some of the things to watch out for when using the Delphi 64-bit compiler (or when preparing your 32-bit code for the 64-bit world). 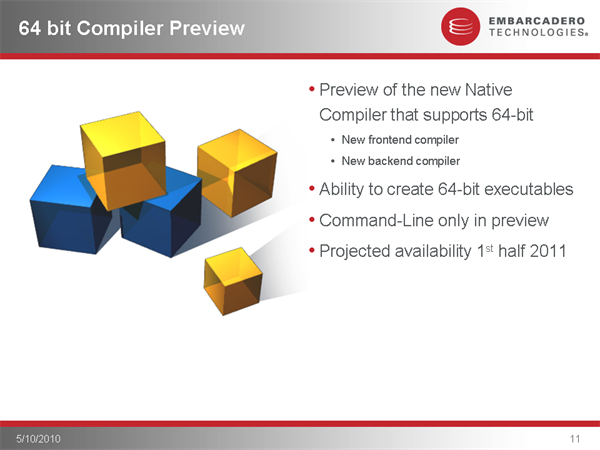 The Delphi 64-bit Compiler Sneak Preview is now available with information and a first look at the 64-bit compiler in action and an opportunity to join our beta test program or be notified when the new version is available. An updated RAD Studio, Delphi and C++Builder Roadmap is published on the Embarcadero Developer Network. Embarcadero has just published the new RAD Studio Roadmap. This Roadmap includes information on the upcoming Delphi Fulcrum, supporting both Windows and Mac OS X application development, Delphi Wheelhouse (adding Linux support), the 64-bits Compiler Preview (early 2011), Delphi Commodore (the full 64-bits version) and project Chromium. This preview compiler is currently scheduled for the first half of 2011. Nick Hodges has published an article on Developer Network about the future of the Delphi Compiler. In this article, Nick talks about the Compiler Front End (the part that defines what the language is), with the idea to create a new Front End to offer a choice between a new, non-legacy syntax and the older way of coding (read the article to example of legacy syntax). New code would have to be put in a new type of code module (so it looks like there would be no mixing of code, although you may be able to use both kinds of modules in your projects). Nick also talks about the Compiler Back Ends (one for Delphi, one for C++) which currently produce 32-bit binaries for Windows. A new Back End would be able to produce 64-bit for Windows, and should be shared by both Delphi and C++, and "a bit more flexible with respect to what architecture it targets" (or so Nick writes). Doing a new Compiler Front End and unified Back End (for both Delphi and C++Builder) will take time. 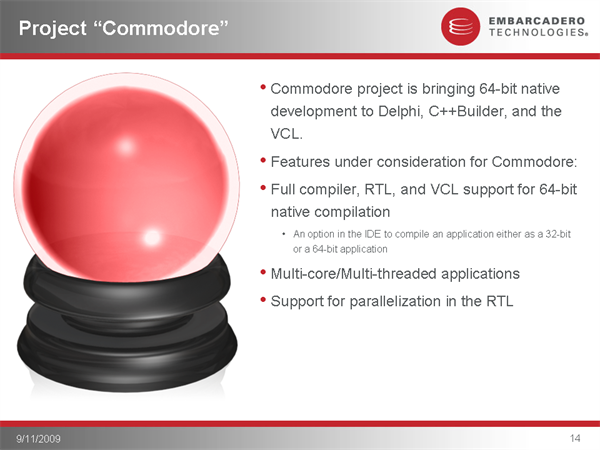 The team plans to release a preview of the 64-bit compiler (just the compiler, not the IDE) in mid-2009, and the final 64-bit version of Delphi should be ready min-2010. 2008/12/16 - "A year in the Life of Delphi"
Pawel Glowacki blogs about Nick's webinar about "A year in the Life of Delphi". Read this blog post if you missed the webinar. This webpage © 2005-2015 by Bob Swart (aka Dr.Bob - www.drbob42.com). All Rights Reserved.